The Juki DDL-5550 Industrial Sewing Machine is a straight-stitch, one-needle equipment that is manufactured for use with medium-weight fabrics to create a wide range of everyday apparel. Although made as an industrial sewing machine, it can also be ideal for domestic use. Why choose the Juki DDL-5550 Industrial Sewing Machine? 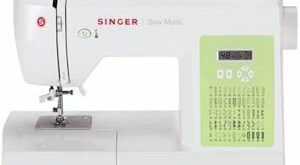 The Juki DDL-5550, also referred these days as the Juki DDL-5550N is made by the Japanese manufacturer Juki, which is the leading company in terms of sewing technology and quality. This sewing machine alone is designed to operate quietly, making them ideal for use at home. With the addition of the servo motor, running this equipment is even quieter. These days, you can still get a unit with the noisier clutch motor, but in most cases, you can have the option to change it into servo. 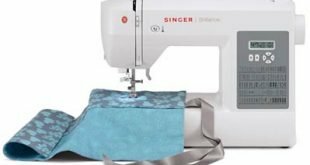 This is an industrial sewing machine that is designed for home use. In short, your tasks will be quicker and more convenient to finish whatever your sewing projects are, whether it’s creating or repairing garments or fixing tarpaulins and sails. 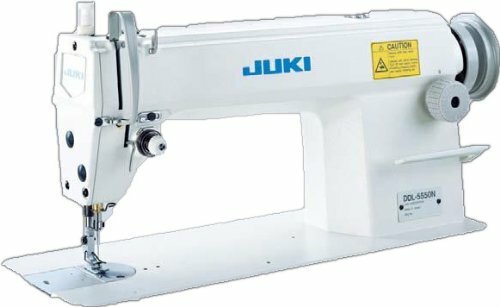 This Juki sewing machine utilizes a servo motor which is quieter and lighter compared to the clutch motors. The servo is also more energy-efficient, specifically saving as much as 90% than when you’re using clutch motor. It also provides a consistent sewing speed regardless of the amount of pressure on the pedal. 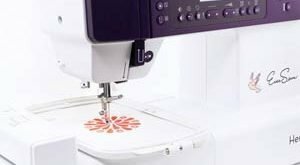 With a minimum sewing speed of 5,000 stitches per minute and a maximum of 5,500 stitches per minute, the sewing machine is definitely a great investment whether you’re thinking of running a large-scale garment factory or establishing yourself as an independent work-at-home seamstress or tailor. Despite being manufactured for home use, this is still an industrial machine and thus isn’t portable. It is shipped to your doorstep completely assembled with a dimension of 48″x20″x48″ inches and a weight of 250 lbs. Who should buy the Juki DDL.5550? Arts and crafts enthusiasts who are passionate about fabric works, including quilts. The lift of the presser foot is 5.5 millimeter by hand and 13 millimeter by knee. The built-in bobbin winder saves time because it lets you refill bobbins while sewing. May not be suitable for very light fabric like satin. You might want to specifically order model Nos. DDL-5550NA-7 or 5550NA. Can be difficult to operate on heavy-weight materials such as leather. You can consider opting for the DDL-5550NH-7 or the 5550NH models. Remember that this is a straight-stitch sewing machine only. So don’t expect it to make excellent zigzag stitching for you.